Wow ... I wished I could shoot a firearm in real life like this! I guess I have gotten so used to jiggle in real life that I expected it in an FPS like FO4. The only thing I did not like about the jiggle in FO4 is that the jiggle appears to be random. For real shooting .. the jiggle usually follows muscle twitch and breathing ... and of course fatigue. However; FO4 is a game ... a very good one at that. I also like the idea behind this mod. It also looks like you made a good implementation of jiggle removal. Now ... everyone can shoot like a Navy Seal or Spec-ops dude! Actually, the way they do it is to minimize the sight and hold times during target acquisition. It's not really about making the game realistic, it's more about removing the broken system. Proper recoil can still be made, it's a matter of making a new aim models in CK and editing the animation files. People asking about a version that have slight jiggle, rather than non at all, don't understand that it's not a proper solution to the problem. Doing recoil with jiggle like Bethesda did is just plain wrong, not only from the "gunplay" enjoyment perspective, but also modability. And no, it's not realistic, unless you're holding your gun for a first time and completely don't know what you're doing. Guys, low jiggle version will NOT happen, I will never support such awful system. If you want more realistic recoil, either ask other modders to edit the aim model and fire animation files, or do it on your own. That's the only proper way to do it, the method that can be as aesthetic and as realistic\arcadey as one could possibly want. Hi, i am working on something and i don't know how to edit the behavior files don't suppose you could explain how you did it?. There seems to be no muzzle rise now for some modded weapons. Is it because they are not supported yet? Question; would it be possible to change the way that your weapon climbs up on your screen in 1st person whilst falling? Because as is right now, the body of the weapon rises up to cover the center of the screen whilst you're falling, meaning that you can't take certain types of jet-fueled mid-air trick-shots. I really love this mod, but in my recent playthrough I realised that this has no effect on modded weaponry. Is it possible to make a compatibility patch for certain modded weapons? Or could you maybe just quickly explain how your weapon jiggle works. 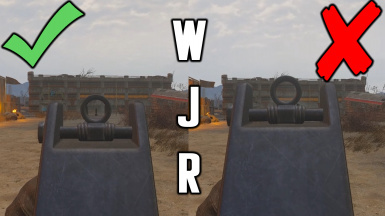 For example if it only uses a new recoil animation maybe I could try and work around it myself and add a suitable jiggle-less recoil animation from a different weapon and add that on the modded weapon. I of course understand that modding is a complicated endeavour but I simply can't play with jiggles anymore and noticing that the modded weapon that I've had my character grind for has the jiggle is rather disheartening. I will make a second version that uses this tweak as well. Hoping to see the second version some time in the future! Both of those fixes together would massively improve gunplay in both perspectives for those like myself who like to switch between the two actively. Doesn't work :( at least with modded weapons. is there a reason why you wont port to xbox? its likely an issue lying in what XBOX mods will allow and not what Max can do, sadly you may never see this mod due to it directly editing the base game file, the only workaround (that may or may not be possible im not a modder) is if he went through and individually created his own edited recoil file for each and every weapon. This mod conflicts with the reload animation fix ( https://www.nexusmods.com/fallout4/mods/21488 ) since they both touch the same file. The optional file in that mod is the key fix/workaround. If you change from 1st to 3rd person view while reloading, the animation will restart. The optional file in that mod has a workaround of just stopping the reload animation during a perspectiev change. Any chance you could merge that workaround into your mod?